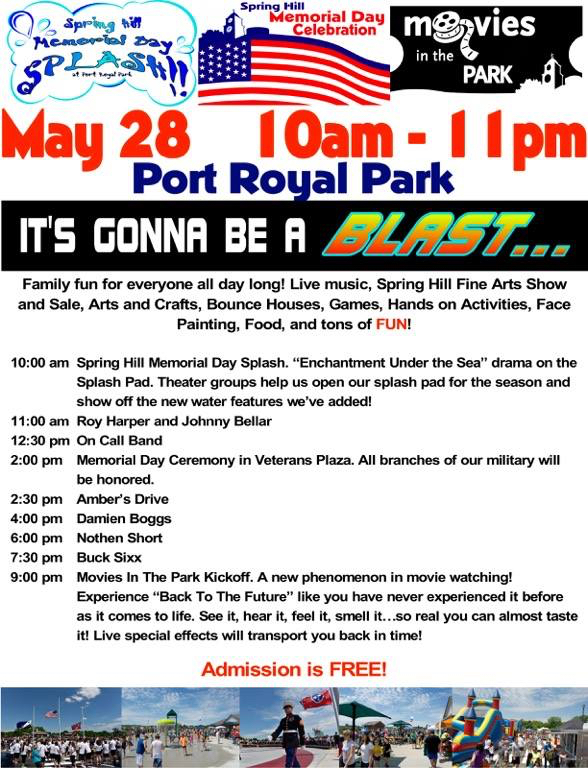 It will be a day to remember our armed forces members who paid the ultimate sacrifice, and a day filled with family fun for everyone, from 10 a.m. to 11 p.m. Saturday, May 28, at Port Royal Park. Enjoy live music, a Spring Hill Fine Arts Show and Sale, arts and crafts, bounce houses, games, hands-on activities, face painting, food, and much more. 10 a.m. - Spring Hill Memorial Day Splash. “Enchantment Under the Sea” drama on the splash pad. Theater groups help open our splash pad for the season and show off the new water features we’ve added. 2 p.m. - Memorial Day Ceremony in Veterans Plaza. All branches of our military will be honored. 9 p.m. - Movies In The Park Kickoff. A new phenomenon in movie watching. Don't miss it. Experience “Back To The Future” like you have never experienced it before as it comes to life. See it, hear it, feel it, smell it…so real you can almost taste it! Live special effects will transport you back in time.